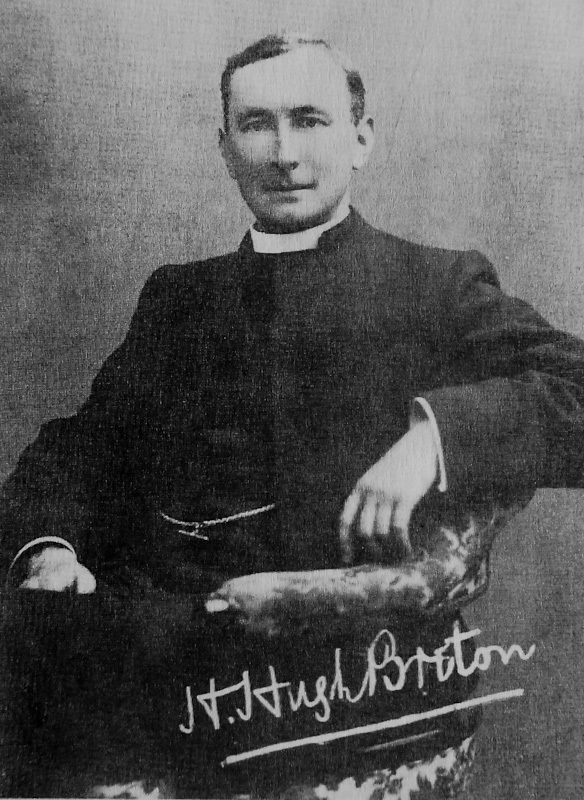 The eldest of five children, Henry Hugh Breton was named after his father, which may explain the enigmatic ‘H’, and his customary use of his second name. Born in Southampton on 16 September 1873 he attended Southampton Boys’ College followed by Christ’s College, Cambridge, where he obtained a Bachelor of Arts degree in 1895. He spent a further year at Wells Theological College and was ordained a priest in 1897. His first appointment was as curate of Christ Church, Hastings, and in 1898 he married Mabel Pennington Gorringe – both he and his new wife had strong family connections with Sussex, and according to the Introduction to the 1990 facsimile edition of Spiritual Lessons from Dartmoor they were childhood sweethearts. In the opening chapter of his first book, Beautiful Dartmoor, Hugh Breton recorded his initial lack of enthusiasm for the landscape: ‘My first experience of the Moor was a visit to Princetown on a wild stormy day in June, 1898, when a succession of storms was sweeping the Moor, and I went away saying that it was nothing but a howling wilderness’. Since he and Mabel were newly married at the time it’s understandable that they would have found Princetown somewhat lacking as a honeymoon destination – an hour or two there has probably discouraged quite a few people from further explorations of Dartmoor, and even on a fine day the lack of romance is all too apparent. Fortunately for the history of the Moor, Breton returned two years later, and a ‘peep of the West Okement Valley from the Meldon Viaduct at the close of a stormy day in August, 1900, when the river in full flood was rushing and tumbling over its boulder-strewn course’ won his heart. On 1 November 1907 he was installed as vicar of Sheepstor, a small village on the southwestern side of Dartmoor (currently famous as one of the filming locations for ‘War Horse’: the church tower appears briefly in the trailer). In the early 1900s the village had a population of around 95 people and Breton seems to have had a fair amount of free time for exploring the countryside. Friendships with Robert Burnard (a founder member of the Dartmoor Preservation Association), Richard Hansford Worth, and Sabine Baring-Gould helped to develop his interest, and together with Worth he embarked on the task of re-erecting the fallen stones of Brisworthy Circle. More information on Breton’s extensive antiquarian activities, and his restoration of the magnificent Rood Screen belonging to Sheepstor Church, can be found on the excellent Legendary Dartmoor website. His first five books were published during his time at Sheepstor, and were sold to raise money for the restoration of the screen. Breton moved to Morwenstow in October 1923, after a brief interlude at Alfriston in Sussex, and stayed until May 1927. He published four more volumes in aid of repairs to the church roof, including one on Hawker, and made plans for a book on shipwrecks which was never completed. He also raised money for the erection of a granite cross in the churchyard in memory of the many drowned sailors buried there, and on two occasions held services at Duckpool which he referred to as ‘Blessing the Sea’. He explained these as having three main purposes: ‘to invoke God’s blessing on the sea, on the ships which navigate the sea, on the thousands of brave men who man the ships, both in the Royal Navy and in the mercantile marine; to pray for the fruits of the sea on which we are so dependent for our food supply; to remember before God those who have been drowned in the sea, especially those whose mortal remains have been washed ashore on the coast line of the parish of Morwenstow’. Given the comparatively short time that he spent in Morwenstow Breton seems to have thrown himself into his work there with commendable vigour, and to have formed a genuine bond with Hawker across the fifty-year gap which separated their incumbencies. They clearly shared a love of poetry, and of the wild places, stone crosses, ancient barrows, and holy wells of Devon and Cornwall, and Breton’s book on Hawker includes accounts from parishioners who had known and worked with him. In 1927 Breton moved to Dean Prior, which had at one time been the home of another poet parson, Robert Herrick. He produced six more books about Dartmoor before moving to Meshaw with Creacombe in 1931. Failing health led to early retirement in 1933, and another move to back to Sussex. He died there in 1936 and his wife outlived him by only four years. They are both buried in the churchyard of St Mary’s, Westham. Breton seems to have been a much gentler character than his famous predecessor at Morwenstow, and was remembered as a kind man, noted for his sense of humour. A Fellow of the Royal Meteorological Society and a passionate preserver of the Dartmoor landscape, he made important contributions to the early explorations of the moor and the recording of its history. His books lack the human insights into life in a rural community offered by writers such as Francis Kilvert, but his scientific curiosity and acuteness of observation mean that his beautiful and accurate descriptions of Dartmoor continue to be worth reading today. Many thanks to Tim Sandles, editor of Legendary Dartmoor, for providing me with a copy of Mike Lang’s 1991 article ‘Hugh Breton M.A., a brief account of his life and works’ (Dartmoor Magazine no. 24, pp.4-5), which was essential to the writing of this piece. Mike’s Introduction to the various facsimile editions of Breton’s books was a valuable source of information on Breton’s time in Morwenstow. Spiritual Lessons from Dartmoor Forest (Part I). Hoyten & Cole, Plymouth, 1929. Spiritual Lessons from Dartmoor (Part II). Ridouts Limited, Whitstable, Kent, 1930. Word Pictures of the Bible (Parts I and II). 1929 and 1930.